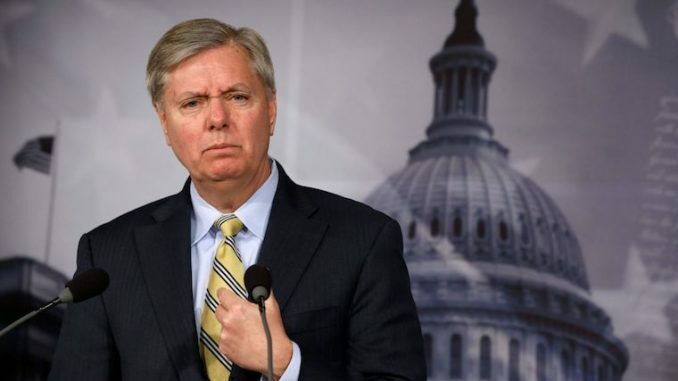 As Neocons and Democrats expressed their disdain over Trump’s decision to pull troops out of Afghanistan, Graham also made his desire for endless wars clear in a series of tweets. Newsmax.com reports: “I have just returned from Afghanistan and can say — without hesitation — ISIS-K remains a direct threat to our homeland and they would dramatically benefit from a reduced American troop presence,” he said. “Our Afghan partners are incapable of subduing the threat posed by ISIS-K alone. In addition, our intelligence capability and military might cannot be replaced by any other regional ally when it comes to subduing ISIS-K in Afghanistan or Pakistan. “Like in Syria, troop withdrawal should be based on conditions on the ground. Trump announced Wednesday he will pull troops out of Syria. Secretary of Defense James Mattis announced his resignation Thursday — around the same time it was reported the White House is considering withdrawing thousands of U.S. troops from Afghanistan. It can’t cause another 9-11. Bush is not president. 9-11 was covered with his fingerprints.